This was a great little conference with some wonderful papers. I was intrigued by the fact that so many other presenters used some form of Powerpoint. It's true that the topic was image-friendly, but the tradition in history/literature conference papers is simply to read a paper. Maybe the discipline is changing! My favorite presentation was by Rachel Crawford. She demonstrated connections between English formal gardens and Milton's garden of paradise in Paradise Lost. I'm excited to be able to use this in teaching. 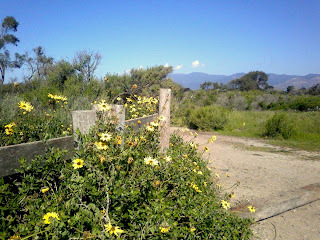 Here's a picture of flowers near the beach at Coal Oil Point from my morning run. Crawford, Rachel. “Simplex Munditiis: English Formality and the Seventeenth-Century Garden.” Conference Paper, UCSB Early Modern Center, 2009.